Bisibele Bhaat is a traditional rice based dish from the state of Karnataka. 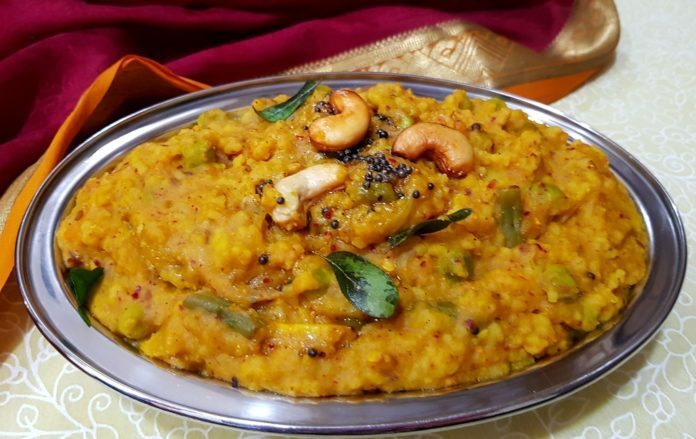 Made with rice, tuvar dal, vegetables and spices, this makes for a wholesome meal. Wash and soak tuvar dal for 1 hour. Pressure cook the rice and dal with turmeric powder, salt and 4 cups of water for 3 whistles. Keep this aside. Soak tamrind in ½ cup water for 30 minutes. Squeeze and mash the tamarind in water. Strain and keep it aside. Heat a pan and dry roast all the ingredients of bisibele spice powder. Add ¼ tsp oil while roasting red chillies. Blend all the ingredients to a fine powder. Keep this aside. Add 1 tsp mustard seeds, 1 tsp cumin seeds, 2 dry red chillies, 10 to 15 curry leaves, 1 chopped onion and saute for a minute. Add broken cashew nuts and saute for another 1 to 2 minutes. Now, add all the chopped vegetables (carrot, green peas, potato, french beans), turmeric powder, salt, tamarind pulp, jaggery and give it a good mix. Add 2 cups of water and cook covered for 8 to 10 minutes or till the vegetables are cooked. Now, add the cooked rice and dal and mix. Add the bisibele spice powder and mix well. Allow the spice powder to blend well with the rice. For the tempering, heat a small pan and add 1 tbsp ghee. When the ghee melts, add 1 tsp mustard seeds, cashew nuts, curry leaves and asafoetida. Pour the tempering into bisibele bhaat. Serve hot with pickle, papad and raita.